After the changes were complete, I didn’t notice any difference on my Mac Mini. Yeah, I restarted my computer. Nothing happened! No new display modes were available. After struggling with the issue for a while, I finally figured out what was wrong. The problem was the monitor. I’m still using a 4:3 monitor, running at 1280 x 1024. In order for HiDPI to work, the display has to have enough resolution – both horizontally and vertically. After a quick trip to the Apple Store, returning with a Mini-DisplayPort to HDMI cable, I used a TV as the monitor. 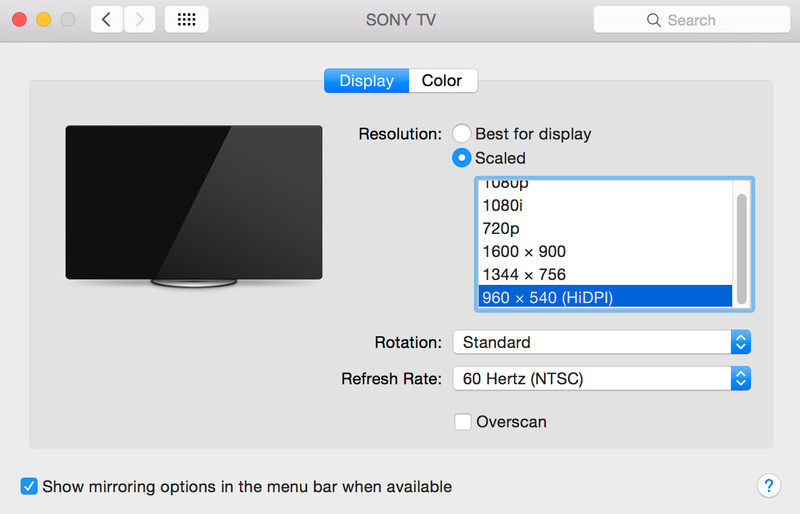 It maxed out at 1080p – adding only a slight boost vertically – but it was a 16:9 display. Would a 1920 x 1080 screen make a difference? It did, and it was impressive. Normally, when a computer is hooked up to a TV, the text might be blurry and tiny. HiDPI can help remedy that issue. By treating the display as a 960 x 540 screen, but with OS X using high resolution graphics for the user interface, the image can be big and crisp. It’s similar to the iPhone. When the iPhone 4 was released, it acted in the same way as the 320 x 480 screen of the iPhone 3GS. The main difference is that the iPhone 4 was using four times as many pixels. The resolution was bumped to 640 x 960. Using the “Alt” key, while clicking the “Scaled” button, was used to bring up additional display options. Apple applied what they learned on iOS and moved it over to OS X. The old 27″ iMac maxed out at 2560 x 1440. After quadrupling the pixels, now HiDPI is the standard. Not wanting to give up on my 2009 Mac Mini, as I’m not that impressed with the 2014 models, I’m glad that I’ve been able to figure out a way to bring new life to my Mac. I might even get a new monitor. Apparently, a Dual-Link DVI connection would allow my Mac Mini to power a 2560 x 1600 display – or 1280 x 800 in HiDPI mode. That’s not as much working area as the new iMac, but I suspect that the more economical plan will be easier on my eyes and easier on my budget. Next Next post: Where’s the Turkey / Thanksgiving Emoji?